NEW DELHI (AP) — A Samsung Note 2 phone emitted smoke and sparks on a flight from Singapore to southern India, the airline said. The phone was found in the bag of a passenger in an overhead bin after other passengers reported smelling smoke in the plane, IndiGo said. It said there was no fire but sparks and smoke were coming from the phone. The crew used a fire extinguisher and then placed the phone in a container filled with water in a lavatory, the Indian airline said in its statement. The aircraft made a normal landing at the Chennai airport and all passengers deplaned normally, it said. The company said it had been informed of an incident in India with the Samsung Note 2, which uses a replaceable battery and was released in 2012. "We are in touch with local authorities to gather more information and investigate whether there were any external factors involved," the company statement said. 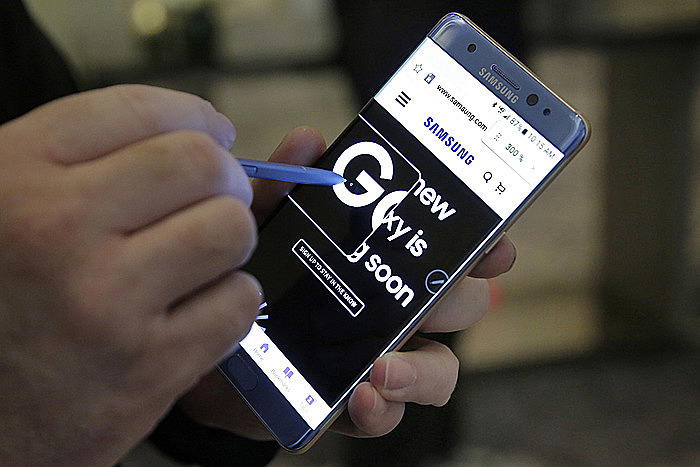 Samsung has recalled 2.5 million newer Note 7 phones after dozens of reports of battery fires attributed to a manufacturing flaw. Authorities in several countries have banned their use in aircraft.